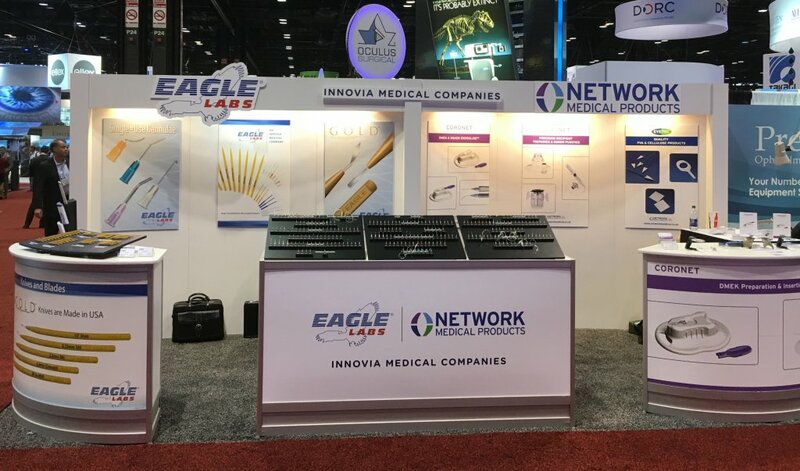 Network Medical joined it’s sister company Eagle Labs and its USA distributor Coronet Medical Technologies at the AAO (American Academy Ophthalmology) in Chicago, USA. The 20 ft wide stand stood proud at the event and was a great demonstration of the Ophthalmic division of Innovia Medical. The recently launched DMEK EndoGlide™ took pride of place at the event with several seminar sessions highlighting positive clinical results. In particular the application of the DMEK EndoGlide™ for increasing control during challenging DMEK cases was covered. CLICK HERE to find out more about the DMEK EndoGlide™.